Manila, Philippines—Weaving is a practice that has been woven into Filipino history. Up to this day, traditional weaving is still practiced as both livelihood and art. It is a craft that only requires only few resources and ingenuity—something Filipinos pride themselves in—to create a wide variety of useful products that not only help communities, but also inspire people and culture. This is the foundation of SINING+HABI. 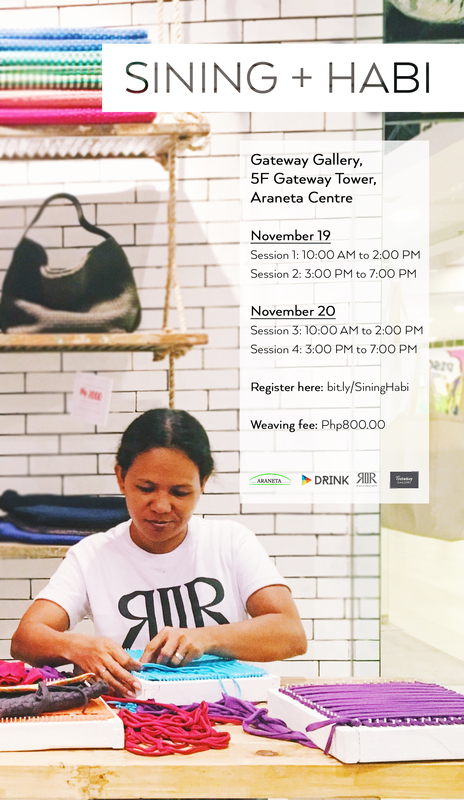 SINING+HABI is a weaving workshop organized by Rags2Riches and its partners the Araneta Foundation, Drink, and the Gateway Gallery. Various weaving artisans from Rags2Riches will share stories of how they got into weaving and why they practice the art. Guests will then be taught the basics of weaving by the artisans themselves. Guests will have the opportunity to share and discuss their work with other guests. Weaving is a staple in sustainability and creativity as it uses natural materials and can even be made from recycled scraps of cloth. Depending on the material and style employed in weaving, the end-product varies, creating an entirely new design with a purpose and personality of its own. The art of weaving teaches the value of thinking of new and innovative ways to create art, make a living, and contribute to the overall sustainable development of communities and society. We have to actively think of ways we can be sustainable at every chance we get. Even through small acts like weaving scraps of old rags into new handbags or improvising a water filter with rocks and used plastic bottles, we can significantly reduce our environmental impacts collectively. With global and local trends turning to sustainability as the need to fight climate change rises, it is now more important for us to contribute in our own little ways. SINING+HABI offers you the chance to learn about and experience a truly Filipino art form that combines style and sustainability. Join one of the SINING+HABI sessions, and enjoy entertaining and productive activities where you can nurture your artistic self while discovering new ways to live sustainably. Register now at bit.ly/SiningHabi. See poster below for more details.